Alternative Title : Not getting out of bed! After a 4-day trip, a serious case of overeating and some "missing my bed" moments, I decided that this Sunday I wouldn't get out of bed no matter what! I broke this promise only for the sake of eating (what a surprise!) and went to the kitchen. Praline spread, some bread and I'm ready to go!! I wanted to make some tea, so I hovered a little over my tea collection -don't judge me people!! The winner for this morning being Lipton Strawberry Cupcake green tea and yes, it tastes as delicious as it sounds! 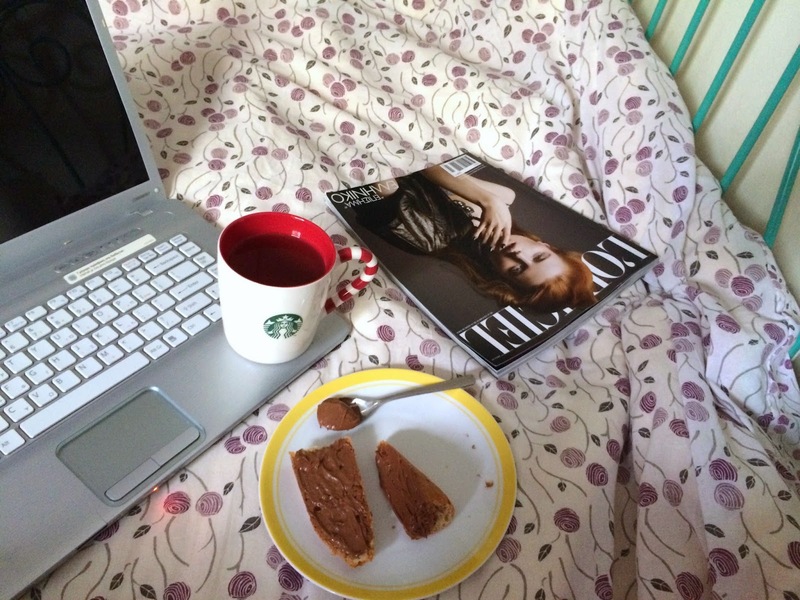 Back to bed, cozied up and ready to finally finish reading my L'OFFICIEL and catch up with some of my favourite blogs that I have seriously neglected this week. What is your perfect Sunday morning?! + here's a little something that got stuck in my head all week - enjoy!